Nu-MAG™ replaces magnesium stearate and stearic acid; opens up opportunities for 100% organic products. 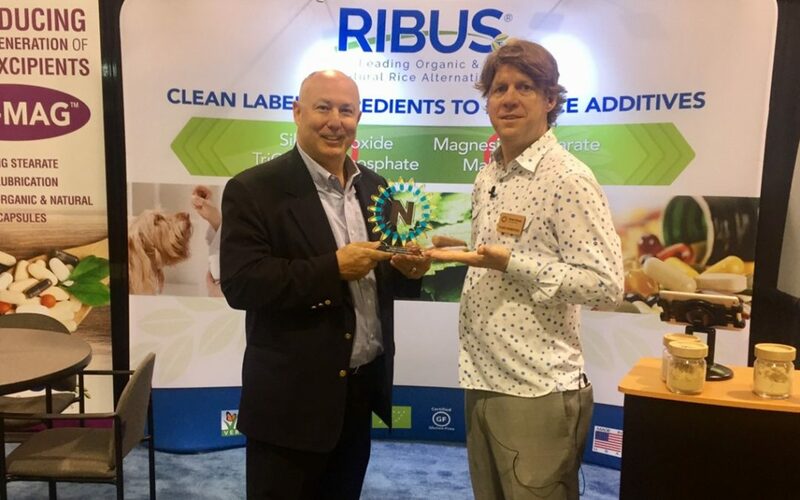 ST. LOUIS, MO (March 14, 2017) — Leading food ingredient and supplement excipient supplier RIBUS is proud to have won the New Hope NEXTY Editors’ Choice Award for its new ingredient — Nu-MAG™ — at the Natural Products Expo West & Engredea event this last weekend. Nu-MAG™ can replace magnesium stearate and stearic acid, synthetic ingredients previously considered vital in making dietary supplements but prohibited in organic products, thus opening up opportunities for manufacturers around the world to make 100% organic products. A natural version of Nu-MAG™ is also available. Nu-MAG™ provides tablet and capsule manufacturers the required lubrication, while also enabling “clean label” statements. The ingredient is being tested by companies in the US and around the world, and is in the process of gaining the Non-GMO Project Verified certification. All the other products in the RIBUS portfolio — Nu-BAKE®, Nu-FLAC®, Nu-FLOW®, and Nu-RICE®— are widely used to replace synthetic ingredients such as silicon dioxide as well as soy lecithin and monoglycerides in the food, beverage, pet, and dietary supplements sectors. These products just earned Non-GMO Project Verified certification, and are available in both natural and organic forms. In 2015, New Hope awarded RIBUS’ organic Nu-FLOW Engredea’s “Editor’s Choice for Best Organic Ingredient” at Expo West. Engredea also recognized RIBUS with a “NEXTY” nomination recognizing RIBUS as a company that “embodies not only the most innovative edge of the natural products industry, but also its deeply held social and environmental values.” All RIBUS ingredients are made from rice hulls and bran grown in California. About RIBUS: St. Louis, MO-based RIBUS is the global leader in natural and organic rice-based alternatives to synthetic ingredients. The company produces Non-GMO Project Verified, natural, organic, vegan, and gluten-free ingredients, and its team of brokers and distributors includes over 100 sales representatives around the world. RIBUS is a member of the Organic Trade Association’s Organic Supplements Council. I am Carmen Rodriguez, supply chain manager of Nutrapharm company. I am interested for your organic excipient because we would like to apply on our supplements formulation. Could you quote organic excipient to replace the following synthetics ingredients?